........so are we breaking the law?? Re: ........so are we breaking the law?? shall be fitted to any such lamp. It means filament lamps are required to carry an approval mark if fitted to the vehicle, LED's are not filament lamps and do not carry the required type approval marks so yes they are in contravention of the regulations if fitted. Could be an MOT fail if spotted by the tester. The MOT doesn't test for things like that, unless specifically mentioned in the testing manual (and easily checked without having to dismantle the vehicle). It will test for things like cracked lenses and white light only shining forward and correct alignment of headlights. VOSA work to different standards. They can enforce any law governing Type Approval or Construction & Use as well as the usual safety stuff. If VOSA get their teeth into your car, you're stuffed - no matter how legal you may think it is, they will find something. VOSA could give you an enforcement notice, but unless the vehicle is dangerous (that could include dazzling other road users) the police won't bother you. VOSA will only get involved if you are very unlucky, or if the police ask them to check the car over - probably because they can't find anything wrong themselves. Will you get done for it? Unlikely. Just wait until there is an accident and insurance gets involved, this might be the beginning of a nightmare. They might see it as an unauthorized modification???? Very true......and if it all goes pear shaped, we all know how the insurance companies minds work....."how can we wriggle out of this one chaps"! Is this just a case of the law catching up with the technology. I don't think we should get too excited about this. 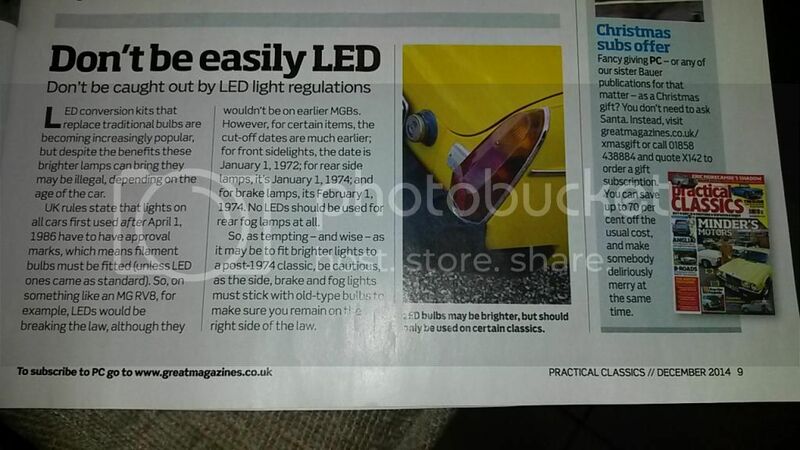 The regulations pre-date led car lamps by some considerable time, so will no doubt catch up at some point. I don't think we're going to see any sort of mass clampdown. Especially since MOTs don't even seem to pick up badly adjusted headlights judging by the number of times I get blinded, but that's another story! Interesting article. I have actually fitted colour changing LED sidelight/indicators to my Sprite as the way they were wired when I got it meant that if the sidelights were on, the indicators just flashed the lamp brighter (by means of a second filament) and were still white. The LEDs actually mean I can have white sidelights and yellow indicators in one bulb and it is clear that I am indicating even when the sidelights are on. This is a good thing. LED brakelights are starting to get a bit bright now - I am fed up of Mercs sitting at the lights at night with their foot on the footbrake, blinding me with their brakelights - yes, they are a good idea to see a car braking from a distance, but could you learn to use the ruddy handbrake instead of subjecting me to more lumens than the Luxor Sky Beam! The regulations and type-approvals do need to catch up though, as LEDs are more efficient and last far longer than incandescent bulbs. We have now got to the stage whereby we can replace the majority of household bulbs with LED equivalents and the types of bulbs in cars are getting close to replicating the beam pattern of an incandescent bulb so that they can be safely retrofitted to older vehicles. Robert T wrote: I am fed up of Mercs sitting at the lights at night with their foot on the footbrake, blinding me with their brakelights - yes, they are a good idea to see a car braking from a distance, but could you learn to use the ruddy handbrake instead of subjecting me to more lumens than the Luxor Sky Beam! This used to annoy me until I realised that you need your foot on the footbrake to activate the eco-engine stop. When my Smart is out of warranty I'll be changing the wiring to utilise the handbrake warning light instead. Another unauthorised modification to tell the insurers - NOT. People blinding me with their brake lights is my pet hate! Particularly at this time of year with dark nights and wet conditions in queing traffic. Why do people do it? They obviously have no consideration for the person behind at all. If it is illegal to show your rear fog light in other than fog or falling snow then why is ok to show 3 rear lights of equal brightness one of them even being at eye level and only feet away. When I was rallying at night I made a point of not looking at the brake lights of the car in front when queing at a control as this could affect your eyesight for the forthcoming stage with disastrous consiquences. I tend to pull down my sun visor these days to block them out. Put your handbrake on, take you foot off the brake and relax your leg. That how I was taught to drive. Ok I'll get off my soap box now and calm down with a glass of wine. I think it is is very poor choice of switch, but it is certainly the choice Mercedes made. I assume all other manufacturers have made the same choice. Bloody stop / start.... Pah! I'm in the M this week and it only does 17 mpg round town at the best of times - can you imagine what the results would be like if it stopped every time I do! Last edited by Lexybhoy on Thu 04 Dec, 2014 19:12, edited 1 time in total. Sorry about signature pic size folks, hopefully reduced now. Regarding stop/start (sorry if this takes us away from the thread). I have a recent Nissan Qashqai with manual transmission. Engine cut off is effective when the car is stationary, in neutral and the clutch is not depressed. Restart is when the clutch pedal is touched and, by the time it is fully depressed, the engine is running ready to drive off. The brake pedal does not activate the engine cut-off. Not sure how the automatic version works as obviously there is not a clutch pedal. Is it worth it? Well, according to the display my CO2 emissions have been reduced by 0.67kg in just over 10,000 miles..... I am not convinced!! My experience of start/stop is as you describe but obviously there are cars that work differently. My point is however that it seems to me that more and more drivers hold their cars on the brakes when stationary for a short time such as at traffic lights. It's not just modern cars with start/stop it's pretty much everybody. This illuminates 3 high intensity rear lights which is very irritateting and potentially dangerous. After all it is illegal to have your rear fog light illuminated in other than fog or falling snow for that very reason. So it seems strange to me that manufacturers can produce cars which have there rear lights illuminated when at rest. Maybe it is the way people are taught to drive these days, I don't know. All I know is it is bloody annoying. Let's start a campaign, FOB, foot of the brakes. Or is it just me? Trevsky wrote: Or is it just me? No, I agree with you - unless I'm saving the pennies . I've tried reducing the pedal pressure to see if the engine will stay off when the lights go out, but they must use the same switch (or two very closely positioned ones). I think that it was a very bad decision for Mercedes / Smart (and probably others) to select the footbrake switch as the stop/start switch. Ironically, I use the manual switch to disengage the system to switch the engine back on. I'd rather be prepared to move than move without preparation, if that makes sense. I'll be linking the handbrake switch to the stop / start exciter wire when the car is out of warranty. That way I'll be able to sit on the handbrake with the engine off AND brake lights off . It will suit me, but will have to be returned to standard when I sell the car as the new owner won't know how to operate MY system.